At Yimelo, we have long been a fan of system on chip (SOC) systems for embedded applications. We recently had an opportunity to provide an instrument what is perhaps the most well known of the SOC systems; a raspberry pi to gather and transmit data. We are no stranger to the Raspberry pi, and have used them for many applications with keen interest since they arrived on the market as a rather low power single core system. 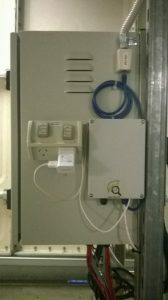 Our project resides in a hospital on Melbourne’s Mornington peninsula, and provides an interface between water meters to allow for a real time water map that calculates the flows from and to multiple sources, including the amount of top-up water drawn from the mains supply to deliver a net interval recycled water measurement in 15 minute intervals. Each input is monitored through a software thread, with interrupt based pulse logging provided via voltage free contact reed switched in water meters. The system has been successfully used to provide reliable data feeds to a third party who were selected through a recent building program to display data. The system has proven to be very cost effective and reliable, with minimal reliance on the SD card through the age old method of “ram-drive”. We have successfully configured the pi to use the SD for boot only, with a more robust SSD external drive something we see as a possible improvement for the raspberry system in future. To learn more about how we can assist you to use SOC computers for applications like the one described contact us for a chat.